We're getting our first really hot weather here in San Diego, and for us that means it is time to fire up the grill. 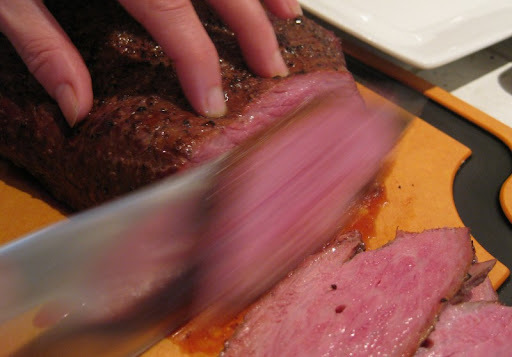 We had a nice prime Brandt Beef Tri-Tip - a beautiful piece of meat with lovely veins of fat marbled through it. It was smoked for a bit over an hour over a mix of pecan and hickory to an internal temp around 140°. 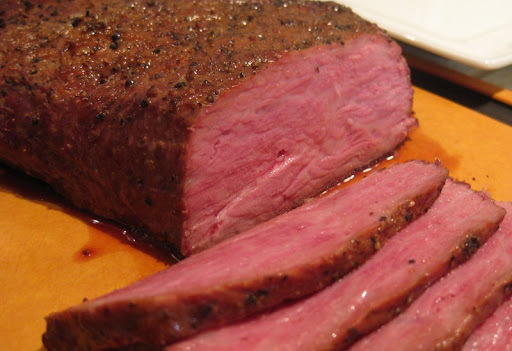 This was our first time smoking Tri-Tip. Wow, was it good! Ahhh pink never looked better! That looks so good, nice and juicy. We love to grill outside as well. The pecan hickory mix sounds great. Sawyer - the prep couldn't have been simpler. No marinade, and the "rub" was just salt and coarsely ground pepper. This looks so delicious. Mike and Sherri, are you looking to adopt a grown kid? I don't ask for much - just a plate of this once a week would do. What temp did you go for here? Let rest at room temp for 20 minutes.